California is finally coming out of a cold snap that has wreaked havoc on many of our state’s farms. In the past week, countless news stories have featured record-breaking lows and devastating crop losses. 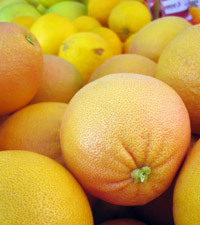 How did this freezing weather affect the citrus growers and other farmers that sell at the Ferry Plaza Farmers Market? Fortunately, our citrus growers were not as hard hit, on the whole, as other California orange, lemon, and grapefruit farmers. Many were able to harvest a good portion of their crop before the first deep freeze. While large farms couldn’t find enough laborers to pick their fruit, most of our farmers have fewer acres and were able to salvage more of their crop because of it. Though some fruits were harvested before reaching their peak ripeness and may not be quite as sweet as usual, they are preferable to no crop at all. The jury is still out on the fruit that remains on trees. Tory Farms, Hamada Farms, Bernard Ranches, Olsen Organics and Everything Under the Sun Farm all reported that they felt optimistic about the unpicked fruit, but it will be a week before they can determine how much damage was done. Citrus fruits with lower sugar content like lemon, grapefruit, and pomelo are at higher risk than fruit with more sugar, since sugar lowers the freezing point. Yuk Hamada guesses that most of his unharvested lemons will be lost to the freeze. Luckily, Hamada Farms’ citrus fruits only account for a small portion of their total production. This kind of diversity is exactly what saved many of our farmers from disaster; it provides insurance against contingencies like weather. Diversity is often their only protection, because most small farmers growing for the farmers’ market don’t carry crop insurance and couldn’t get it if they wanted to. Grant Brians of Heirloom Organics, who grows a variety of vegetable crops, says that insurance companies require exact verifiable quantities of each crop grown, and the kind of production that happens on his farm is hard to quantify. For example, instead of planting 20 acres of carrots that are all harvested and packed at the same time, he might do more than 20 plantings of carrots in a year. If he did quantify his harvest, Grant guesses it would be just a third to half of what is normal for this time of the year. His root crops froze solid in the ground (something he’s never seen before in his many years of farming). Other crops like greens either died or are just not growing, the outcome of which is the same: less produce to bring to market. Temperatures in his area have been in the teens and twenties at night. Other crops that suffered include flowers, artichokes and avocados. Ken Olsen of Olsen Organics planted more that 100 young avocado trees on his property last spring. After the freezes, he says, “they look burnt, like they were in a fire.” The trees that survive will be set back in their development and will yield their first fruit a year or more later than Ken had hoped. Our heartfelt condolences go out to all the farms in the state that have suffered losses. Please offer them your support by shopping at the farmers’ market this winter. And don’t forget to bundle up!